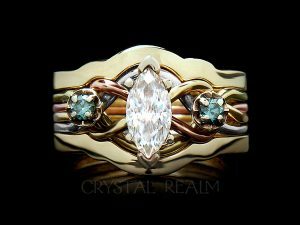 You asked for pictures of the marquise four-band engagement puzzle ring in four colors of 14K gold (yellow, green, white, rose) with different sizes of marquise diamonds and also with a sapphire. Much to my dismay I found very few images of the rings you want to see. This is likely because I don’t get to see all of our clients’ rings in order to get photographs. Most of our puzzle rings ship directly to our clients from our puzzle ring maker, and only a handful have a generous enough timeline to come first to me in New Mexico. But . . . I did find a few that had not been photoshopped yet, so I spent the afternoon getting them ready to post, and here are four beautiful images plus one that’s not in four colors, but it shows a 1CT range marquise diamond puzzle ring on the hand. 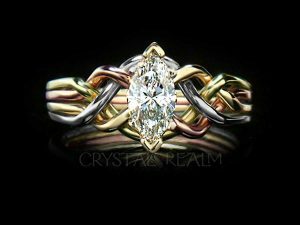 Marquise diamond engagement puzzle ring with four bands in four colors of 14k gold with a 0.41CT diamond and an open weave. 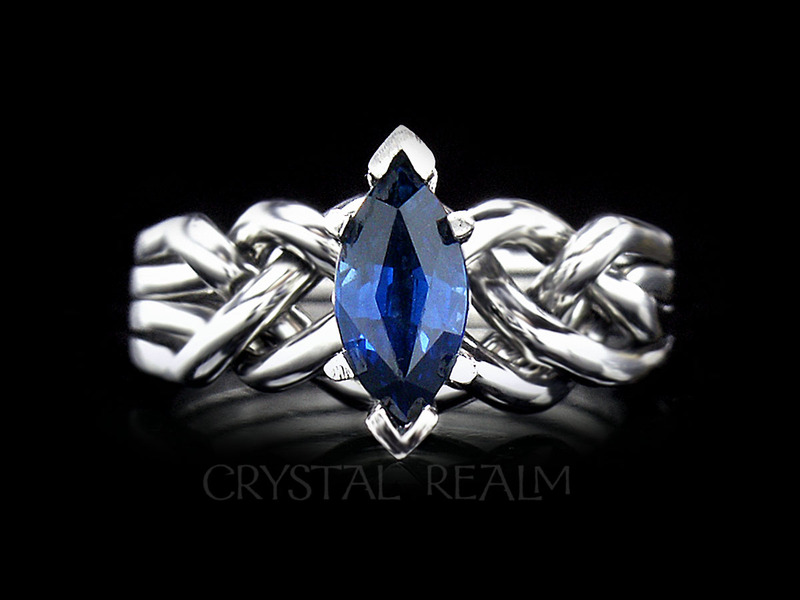 Please note you may order this ring with a diamond from 1/3CT and up under this link. There are add-on prices available for diamond sizes above 1/3CT. four colors of 14K gold: white, rose, yellow, green. guard like this one for a puzzle ring with a standard or tight weave as well. 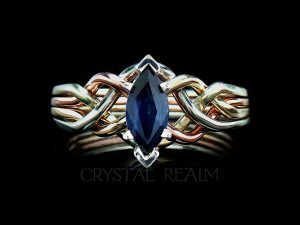 Four-color 14K gold, four-band, engagement puzzle ring bearing a 1/2CT marquise sapphire. 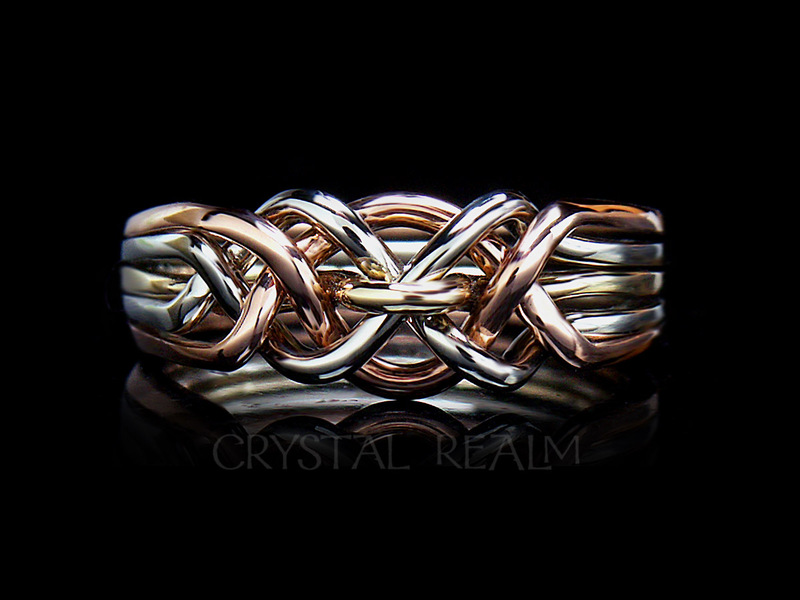 Shown with an open weave, this ring, as are all of our puzzle rings, are available with a tight or standard weave. 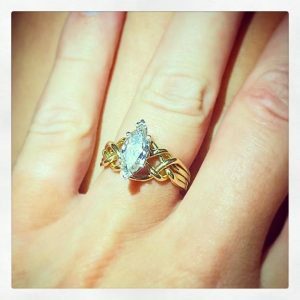 Lastly, this is not a four color puzzle ring, but it’s still a gorgeous marquise diamond puzzle ring shown on our client’s hand. One-carat range marquise diamond puzzle ring in 14K yellow gold with a 14K white gold setting and an open weave shown on our client’s hand. Puzzle rings are often seen as fun, wearable, toys, yet some of them are sophisticated enough to wear as engagement rings and wedding bands. Probably originating in the Middle East, puzzle rings have since become associated with Celtic knotwork, as the eternal nature of Celtic knots is beautifully expressed in rings that are endlessly intertwined. Most puzzle rings in the market, including those historically been found in the Middle East, are cast via the ancient art of lost-wax casting. In this method of jewelry creation, a wax is first carved by hand; then a mold is made from which parts are cast. 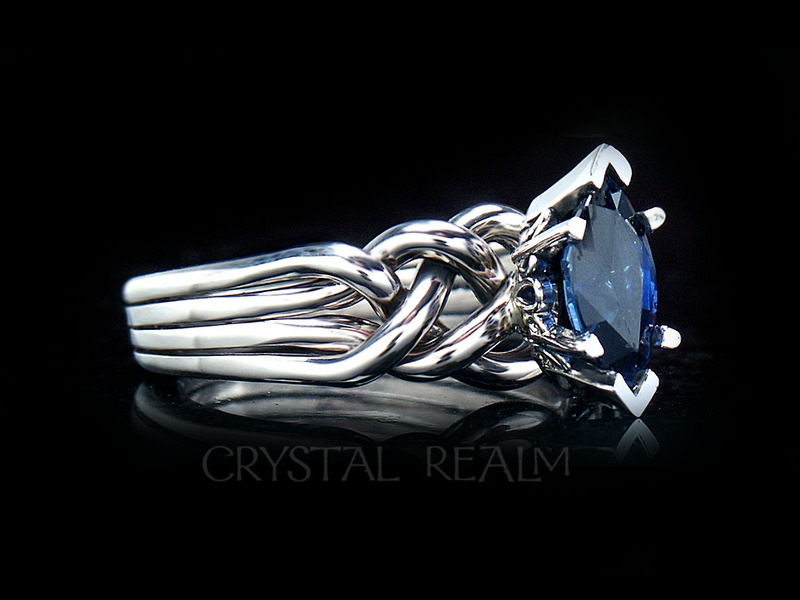 Each band of the puzzle ring is then soldered together, with all the bands forming a pattern when woven together. Yet there is another way to make puzzle rings, one that requires the skill to make each ring as a one-off original. The method is hand-weaving, and this is an art practiced by only a few puzzle ring makers world-wide. A 5mm round aquamarine on a four-band, 14K yellow gold, medium-weight puzzle ring with a 14K white gold setting. Our hand-woven puzzle engagement rings are woven differently depending on many factors: the shape of the diamond or gemstone, the size of the stone, the weight of the puzzle ring, and how wide or narrow you wish your ring to be. The width of the puzzle ring will be determined by the weave, whether a tight, standard, or open weave. The weight of the puzzle ring will, in part, be dictated by the carat weight of the stone that it will bear. 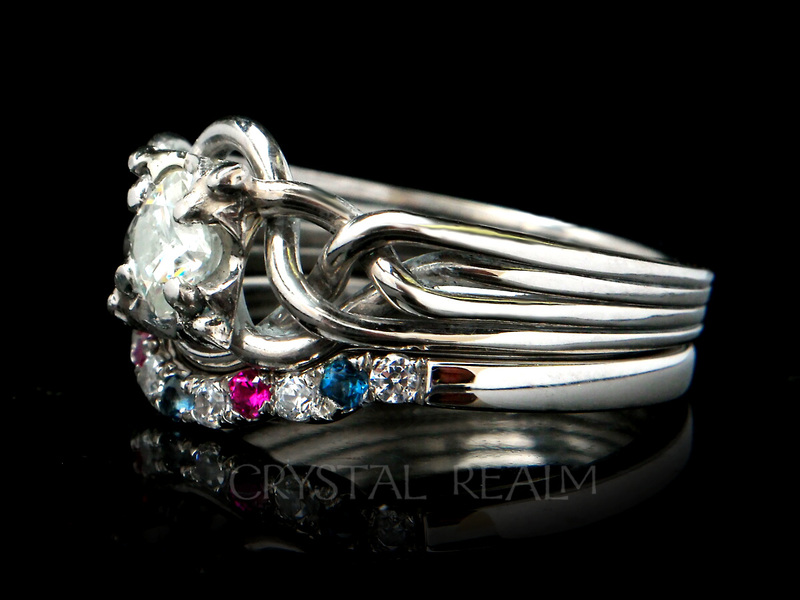 It is important to make the puzzle ring strong enough to hold its intended diamond or gemstone. 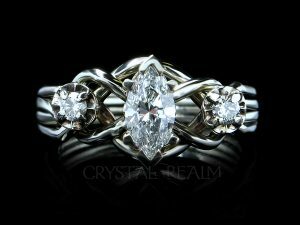 It is our pleasure to guide you to a puzzle engagement ring that is perfectly proportioned for the stone you select. 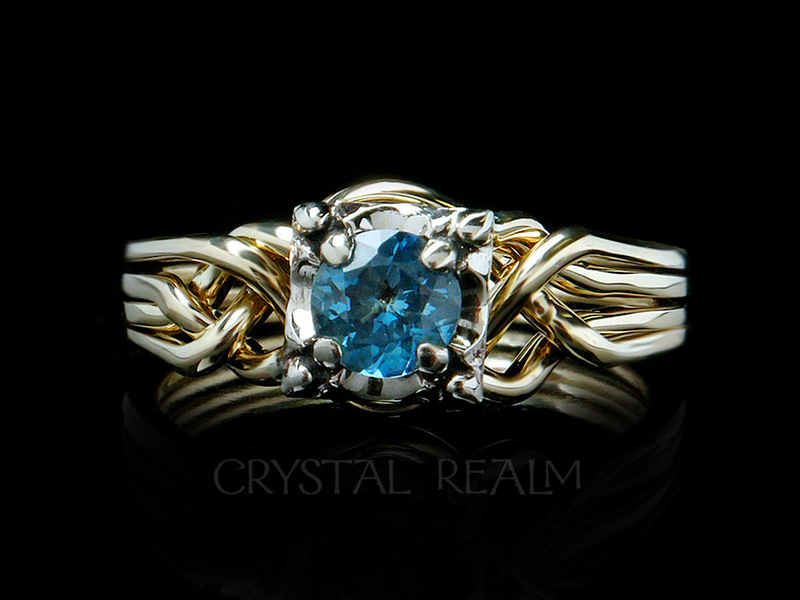 Above is a hand-woven puzzle ring with a round aquamarine and a standard weave. The standard weave on a Guinevere ring means that the loops at the top center of the ring just barely show. Below is a three-diamond ring, hand-woven puzzle ring with an open weave – an open weave results in a puzzle ring which is wider at top center than one with a standard or tight weave. 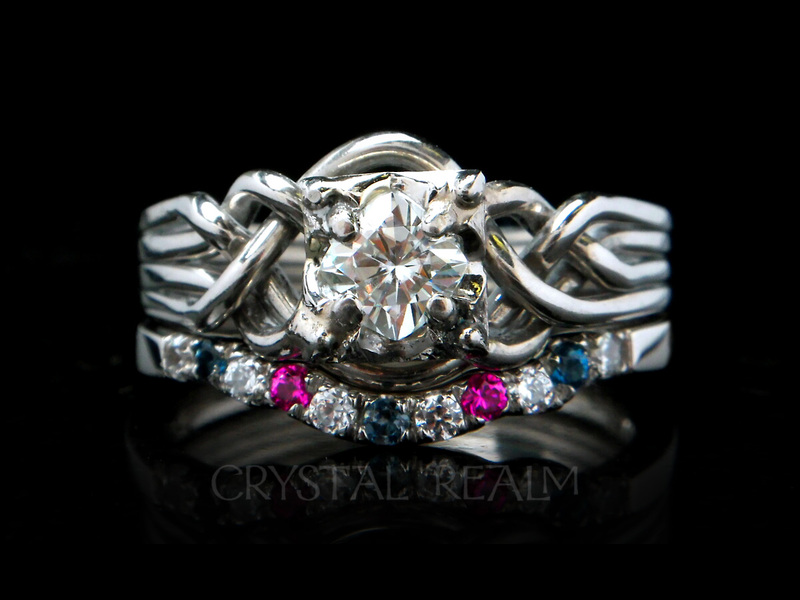 Check back for more information on our puzzle ring styles, weaves, metals, and stones. Hand woven three diamond puzzle engagement ring in palladium featuring a marquise diamond flanked by two five-point round diamonds. The puzzle ring pictured has a total carat weight of approximately 6/10ths carat, though it starts at tcw 0.43 and, in this medium-weight puzzle ring can bear up to 0.80 tcw.